Noor Islamic Bank became the latest bank to launch a ‘Bank of the Future’ contest based on crowdsourcing. Known as the ‘Shape Your Bank’ initiative, the bank is offering $20,000 for different ideas to improve the whole banking experience and products. Noor Islamic Bank is crowdsourcing ideas for banking innovations on the future of banking. The bank, which has just launched ShapeYourBank.com, will present its own vision at the GITEX Technology Week 2012 in Dubai on October 14 to 18. Noor will also launch an augmented reality application called ‘Bank in Your Hand’ at GITEX. The app made for the iPhone 5 and the iPad will allow customers to transact with the bank and offer all their products and services. The bank will present its own vision on the future of banking to jumpstart others to think of how they can possibly improve the future of banking and the innovations that can still be developed to improve the future of banking. The bank wants to use the latest technology to offer a more personalised banking experience with personalised products and services. Since the bank’s launch in 2008, it has proven to be a leader in innovations especially in the use of technology and incorporating it with their products and services. 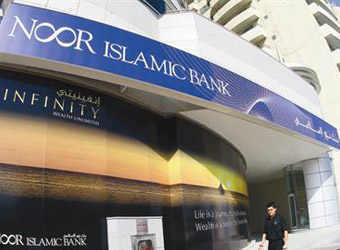 Noor Islamic Bank Crowdsources The Future Of Banking For $20,000 and 4 iPads http://t.co/b8OcU1JN ¦ @NoorIslamicBank any comments? Noor Islamic Bank Crowdsources The Future Of Banking For $20,000 & 4 iPads http://t.co/b8OcU1JN ¦ CommBank @WeBank @DanskeBank any comments? RT @Visible_Banking: Noor Islamic Bank Crowdsources The Future Of Banking For $20,000 & 4 iPads http://t.co/b8OcU1JN ¦ CommBank @WeBank @DanskeBank any comments? Noor Islamic Bank Crowdsources The Future Of Banking For $20,000 & 4 iPads http://t.co/b8OcU1JN @QNBGroup @NBKPage @Gulf_Bank any comments? Noor Islamic Bank Crowdsources The Future Of Banking For $20,000 & 4 iPads http://t.co/b8OcU1JN ¦ @AlRajhiBankM @RAKBANKlive any comments?